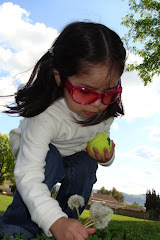 Our Montessori Chronicles: Spill the Beans! I meant to post this earlier in the week but did not get around to it until now… During Wednesday’s class session RJ accidently spilled the pasta from a pouring activity all over the floor. After we cleaned up the pasta I thought it would be a good opportunity to bring out a new sweeping practical life activity. My kids usually help me clean up their crumbs in the kitchen using a lightweight cordless vacuum; however, I think it is a good idea that they also learn how to use a brush and dustpan. 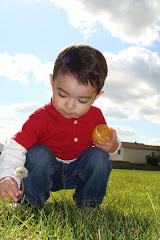 I got the idea from this post at My Montessori Journey. Since RJ’s spill got the attention of CC and Lo, I decided to present it as a group activity and it turned into a fun game for the kids. I demonstrated the process first and then CC, RJ and Lo took turns sweeping. 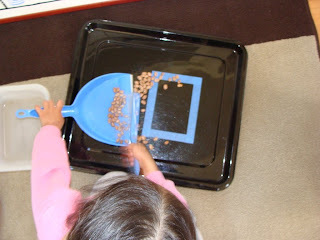 They first spilled the beans from the container onto the tray (the kids would say “oh no, I spilled the beans”). 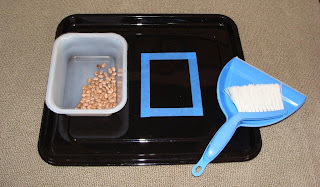 The goal is to sweep all the beans in the square, so that they can then more easily sweep the beans onto the dustpan (not an easy task for any of the kids initially). And eventually all the beans get poured back in the container. During the activity, Lo decided to taste a bean and said that he likes to eat beans but these tasted different. CC then told him that we don’t eat the beans in the classroom because they aren’t cooked yet. All the talk about eating beans led to a change in the lunch menu. 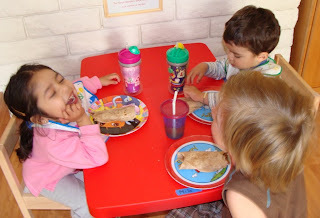 We all enjoyed bean and cheese burritos for lunch that day. Yumm!